The two decades of the late 19th and early 20th centuries continued to represent significant changes in agriculture even though a severe economic depression occurred in 1893. Many of the Land Grant Universities had already been established and their influences on technology in agriculture were being felt. Increased industrialization was occurring as the internal combustion engine in tractors and automobiles started to transform farm power and travel uses. Increased mobility allowed people to gather, exchange ideas and move crops and livestock. Centralized markets were expanded, and refrigerated rail cars allowed the movement of fresh meat products. The American Fat Stock Show brought livestock together for comparisons and although it ended a seventeen-year run in 1894, it laid the ground work for the International Livestock Exposition in Chicago to be initiated in 1900. This event grew to be the largest livestock exhibit in the world. It attracted international audiences, was accompanied by many educational activities, and made significant contributions to the advancement of the livestock industry. He founded a line of Shorthorns in the herd of C.A. Saunders, Manilla, IA, Cumberland Stock Farm which were known as "Cumberland Shorthorns." The name was carried on for several generations through his sons, grandsons and beyond. The Cumberland Shorthorns figured prominently among International and other show winners and top breeding cattle. He was bred by James Gardhouse & Son, Highfield, Ontario, Canada, and he was a top show and breeding bull in the J.G. Robbins & Sons herd. He elevated their herd to one that was considered one of the very best in the nation. Sire of The Lad for Me, first International Grand Champion bull in 1900 who was also an excellent sire. A son of St. Valentine and out of a notable show cow, he was champion at the inaugural International Livestock Exposition held in Chicago in 1900. In good form he weighed 2200 pounds and he became a leading sire in the Robbins herd. In 1901 his service was advertised at “$100 each insuring a live calf.” Sire of the first prize get of sire groups at the 1904 and 1905 Internationals. He was bred in Scotland. He was Grand Champion at the 1902 International and the Louisiana Purchase Exposition, St. Louis in 1904. He proved to be "a remarkably good sire as well as a prizewinner." 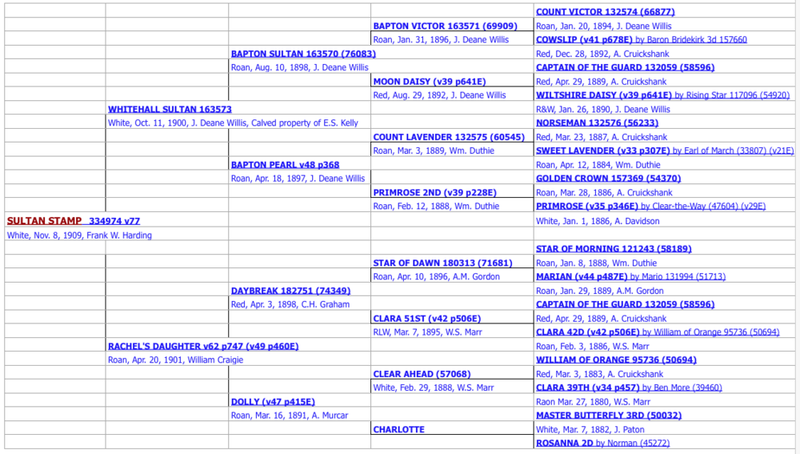 His sire was from Bapton Manor in England. He was considered to be the greatest Shorthorn sire of his time. Sons and grandsons were influential sires of both Shorthorns and great improvers of Polled Shorthorns (Durhams). He was sire of first prize Get of Sire groups at the 1906, '07 and '08 International. Grand Champion at the 1903 International where he sold to Col. Frank O. Lowden’s Sinnissippi Herd for $5000. Described when first shown as a calf as “a furry, sappy youngster,” he became a distinguished sire. His dam was also the dam of several other notable herd sires. The Anoka Herd of the Harding family had a long history in the breeding and promotion of Shorthorns with Frank W. Harding serving as the Executive Secretary of the American Shorthorn Association. He is pictured with his half-sister by the same sire Lord Lovel. He was a sire of consistent winners for Purdy Bros., Harris MO. The herd became well known for cattle that were of the “Purdy type.” Their idea of the ideal type was to have “a short broad head, good eye, well-filled neck vein, broad level back, heavy rear quarters, short legs, straight lines, wide front, deep fleshed, mellow hides covered with mossy coats, and the cows should be heavy milkers.” Several generations of the family were outstanding husbandmen, herd managers, judges and livestock industry leaders exerting their influences on other breeds throughout North America and other countries as well. Grand Champion at the 1904 and 1905 International plus at many state fairs , he was the most successful prize winner of the sons of Whitehall Sultan. Avondale as a young bull. He was clearly the top breeding son of Whitehall Sultan and the leading sire of his time as a contributor to show ring winnings. Although his own show yard successes were lacking compared to some of his contemporaries, his success as a breeder surpassed those of any of his competitors. “Although never put in high flesh, he always weighed close up to 2500 pounds. He was called by some as being too long bodied and off the ground, but he had a phenomenal head, a perfectly arched neck, a lot of quality with tremendous spring of rib, width from end to end and a great spread of back and loin.” He sired first prize get of sire groups at the International in 1909, ’11, ’12, ’13 and ’16 (no shows in ’14 & ’15). His influence impacted the breed for a period that lasted decades. A champion in England and noted sire in the herds of D.R. Hanna, Ravenna, OH and Weaver and Garden, Wapello, IA. Established a line referred to as "Villager cattle" through his progeny. Based on his birthdate he was a member of Avondale’s first calf crop. He was used in the herd of the Kansas Agricultural College (Kansas State) for over ten years. 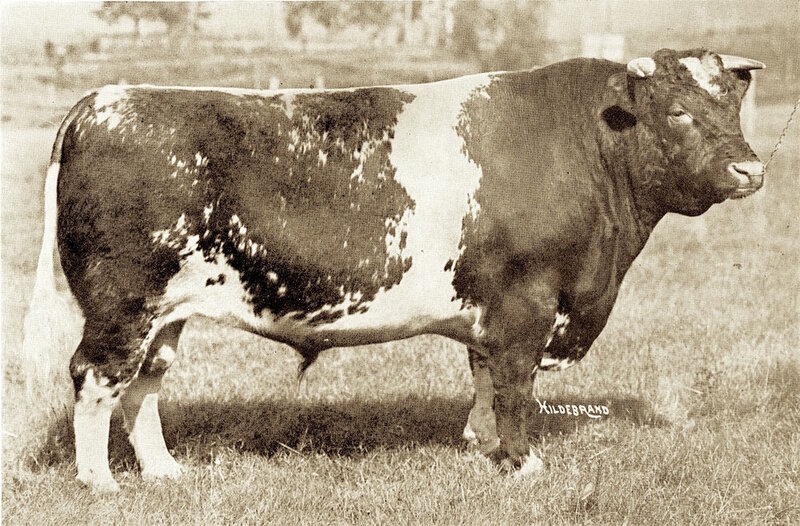 He was described “as an exceptionally smooth, thick bodied bull with an abundance of quality and extremely mellow pliable hide and was especially attractive because of the character and masculinity as shown in his head and crest.” While there he sired more first prize and champion steers than any other Shorthorn bull or bull of any other breed. He was bred at F. O. Lowden’s Sinnissippi Farm, Oregon IL, and was sold in dam with a group of cows for $130. The cow was then resold for $225 to Mr. H. H. Powell, Linn Grove, IA where King Cumberland was born. He was shown and won the Junior Championship at the Iowa State Fair, after which King Cumberland sold for $3000 to George H. White, Emerson, IA. He was Junior and Grand Champion at the 1908 American Royal and International, and then sold to Elmendorf Farm, Lexington, KY for $5000. He was the only Shorthorn bull to win Grand Championship honors at the International three times, in 1910, ’11 and ’13. Following his win in 1913 “his owner, Leslie Smith was hoisted on his back and held there by admiring friends while the bull was led from the arena amid great applause from the amphitheater.” Ironically this three-time champion had barely escaped “the knife” because when he was only a few weeks old his owner decided the calf was a very promising prospect for a champion steer and left instructions for him to be castrated. However his young son had become attached to the calf, countermanded the order and the greatest prize winner of his time remained a bull. Unfortunately, he left no progeny of significance for posterity, only memories of a stellar show-yard career. Diamond Goods was bred and used in the Bellow Bros’ Parkdale herd, Maryville, MO. When shown as an aged bull in 1912 he was undefeated in class including at the International and he amassed several state fair Grand Championships. The Parkdale herd was established in 1880 and started holding annual sales in 1902 which continued for nearly fifty years. Gainford Marquis was bred in Scotland and imported into Canada by J. A. “Jimmy” Watt, Salem Stock Farm whose family made their first purchases of Shorthorns in 1861. He was Junior Champion at the 1911 International and a winner at many Canadian shows. He passed through several herds in western Canada before returning to Salem Stock Farm. His success as a sire was demonstrated by the fact that his progeny won the get of sire class at the Canadian National Exposition for seven consecutive years from 1914-1920. Although he usually stood at or near the top end of his class in the show ring, his most notable win was when he was Grand Champion at the 1913 American Royal. He proved to be a valuable breeder siring the first prize get of sire at the 1917 International. Included in his progeny was the bull, Anoka Champion who sold for $17,000 in 1917.